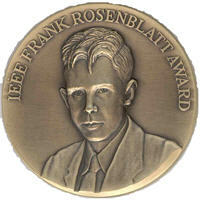 The award is named in honor of Frank Rosenblatt, who is widely regarded as one of the founders of neural networks. Basing his research on study of fly vision, he developed the single-layer input layer and an output layer of neural cells. Frequent presentation of a pattern or patterns resulted in changes in the input to output connections, facilitating future recognition of these patterns, or memory. His work influenced and even anticipated many modern neural network approaches. This page was last edited on 22 April 2019, at 16:26.